For any of you who have been feeling a bit low on creativity and inspiration lately as I have, here are some ways that I and some of my comrades have found works to reignite the spark that is never lost. Sometimes artists may flatline in our inspiration after a great burst of creative expression goes by, or after letting a great opportunity pass… but it’s only temporary, there is no need to “try” to create what should come naturally. Patience is key. Try not to think about “doing” any art… don’t force yourself to come up or complete ideas. Don’t watch Television or go on the internet for a while before you sleep so that your dreams can be fresh and original. You might get a clear message of a project to create next. Go out daily, either for a walk or to the beach or park, people watch. Most importantly, Relax… it’s okay your Mojo always comes back. *Channelling is a way to connect with archangels and spirit guides to receive messages from them. In the matter of art if you do not already have a spirit guardian you connect with then call on Gabriel. She is known as the messenger and aids with anyone whose life purpose is arts and communication. The most important tool you need in channeling is the intention. Pure clear intention and openness to receive whatever comes to you. We have chords of energy surrounding and crossing our entire bodies. “Circuits” if you will… The two main circuits that we use when creating a project is our hands. 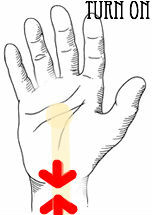 These chords flow to the center of your palms. Before channeling its best to go through and ground yourself to the Earth’s core and create a fresh cycle of energy in your field. Also, make your shield of light around you so that you don’t draw unwanted spirits or energies near you while your opening to receive. 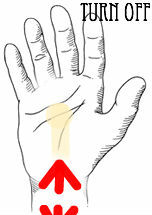 Once you are grounded “turn on” the circuits that run to your palms by either taking your thumb and index finger and imagining your attaching two severed chords of light together on your wrist by touching them together. Do this for both wrists. When you want to “turn off” the circuits that channel then do an opposite motion with your thumb and index finger imagining the circuits are being pulled apart.